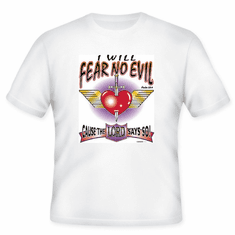 Christian shirt I will fear no evil cause the LORD says so. 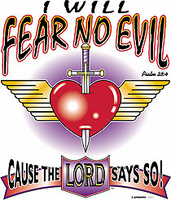 Home/Our HoneVille.com Store/Christian Designs /Christian shirt I will fear no evil cause the LORD says so. Available in a wide selection of shirt styles, sizes and colors. Click on the picture to see all your buying options. Christian T-shirt I will fear no evil cause the LORD says so. 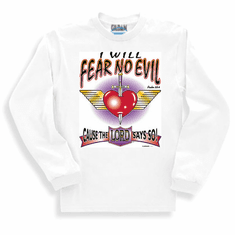 Christian Sweatshirt or long sleeve T-shirt I will fear no evil cause the LORD says so. 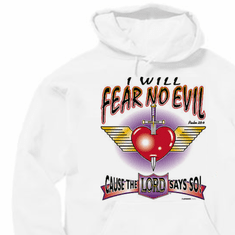 Christian pullover hooded hoodie sweatshirt I will fear no evil cause the LORD says so.